To be healthy and fit requires daily exercises that strengthen our cores muscles. Safe and proper home workout training requires a good exercise mat to prevent injuries and give you a comfortable landing spot. The best exercise mats are not just selected due to its looks. It needs to offer the user the right balance between traction and balance. The last thing you want is slipping on your exercise mat as you work out. This is why choosing the best exercise mat is highly recommended. There are so many brands of exercise mats on the market to buy. It can be difficult choosing the best especially if you’ve never bought on before. We have researched the best exercise mats for to buy so that you can put your time and energy on exercises. Read below and choose an exercise mat that best meets your needs. The Square39 is a versatile exercise mat that can enable you to perform a wide range of exercises with or without shoes. It is 7mm thick to offer you soft and comfortable landing spot. This is one of, the largest exercise mats on the market and offering you wide space to exercise. It comes with a storage bag and Velcro straps to easily store the mat when not in use. It is made using premium non-toxic materials that are backed by a lifetime warranty. Overall, this is a perfect mat for all floors like tile and concrete. The RitFit is a durable and foldable exercise mat ideal for use everywhere you go. 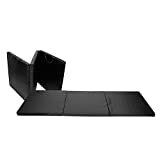 It is a versatile mat that can easily be folded and carried with you. The mat features carry handles to allow for easy carrying. It is a durable pick and features some thick padding to provide you with maximum comfort and support. The top layer is a strong PU material that will not crumble under pressure. It is non-slip, sweat resistant and easy to clean. The design of this mat is unique, and it features Velcro straps that allow you to attach more than one mat. This is a premium large double-sided exercise by Gorilla Mats and a great pick of our selections. It is a high-density mat offering you a thick, soft and comfortable exercise surface. The mat is non-slip providing you with unmatched quality and durability. The cushioning is also excellent with a good balance of toughness, stability, and comfort. It also protects hardwood floors and carpets. The entire package comes with towels to wipe the sweat as you work out and straps for wrapping the mat when not in use. The Sunny Health is a leading brand in the industry and a great pick on our list. 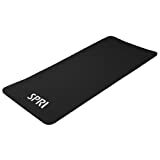 This is a versatile exercise mat that will enable you to perform body workouts wherever you go. It folds in three to become compact for storage and transport. It also features sewn-in handles for easy carrying. This mat offers adequate cushioning so that you can perform a wide range of exercises without worry. It is a pretty lightweight and portable option that can be stored in the car trunk and closets. The Balance From is a high-density exercise mat with great cushioning to protect your legs and the floors from the heavy exercise equipment. It is a large pick three by 6.5 feet mat ideal to fit treadmills and big exercise equipment. This mat will absorb most of the vibrations from the equipment and help prolong their lifespan. It does not bleed colors to the carpet. Overall, this is a durable mat that is easy to clean and backed with a two-year warranty. 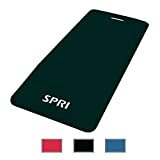 The SPRI are thick poly form mats with great cushioning to offer your body great support and maximum comfort. This exercise mat is lightweight allowing for easy transport and storage. It rolls up with easy and comes with carrying handles for easy movement. You can be sure of the great protection the mat offers your floor and carpet, and you work out with heavy equipment. Overall, this is a great exercise mat coming in blue, red and black colors. This is a versatile exercise mat that works on floors. It is one of the best choices when you exercise in different areas. It comes with a textured and non-slip surface that ensures the mat remains stable with each movement you make. It is a quality choice providing you with comfort and support every single time you land on it. Overall, this mat is quite economical and pretty easy to clean. You can store it flat or roll it. 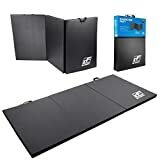 This is a perfect exercise mat for cardio workout and can be safely used with or without shoes. It is pretty comfortable and offers great support to the body. The mat features a thick 7mm mat that offers maximum protection to your floors and carpet. It is a pretty durable choice made using some of the most advanced materials. It is non-toxic and has been tested for silicone, latex, and phthalate. This is a valuable mat and a great choice for living rooms, basement, garage and gyms. 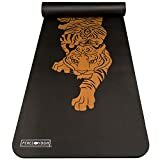 This peace yoga mat comes with a nice tiger image to leave your basement, gym or garage looking stunning. It is a beautiful exercise mat with a thick 0.5-inch cushioning to provide you with great support and comfort. This mat is pretty solid and rarely slips giving you a firm and stable place to exercise without fear. It is a versatile choice that can be used for all forms of yoga workouts. It features an integrated strap that allows you to grab it with easy and transport the mat anywhere you go. This is another high-quality exercise mat from the Square36 brand which is known for high-quality products. It is a super durable choice with a great balance of toughness, comfort, and durability. The mat features 6mm thickness cushioning to protect your body and joints from injuries as you exercise. You can perform a wide range of exercises on this mat with ease. They are safe to use and made from premium non-toxic materials. When you exercise at home or the gym, you need a soft and comfortable place to land where you don’t injure your body. Getting exercise mats is one of the best ways to protect not only your body but also your floors. We’ve reviewed for you the best exercise mat so that you can only concentrate on your fitness. Go ahead and choose an exercise mat that best suits your needs and buy with confidence.